History: (What If? I#33/1) - When Galactus put Terrax the Tamer on trial for betraying his master, Galactus ruled that Terrax would be exiled to a black hole for eternity. He then ordered that Dazzler become his next herald, promising to spare Earth his future wrath once she did so. Once she was transformed into Galactus's new herald, she "skated" out into space, singing a sad song of her slavery. Galactus eventually interrupted her self-pity to demand she find a suitable planet for devouring. After watching in horror as Galactus devoured a lifeless planet, Dazzler swore never to lead his inhabited planets. As years passed, she came across a planet during a search for uninhabited planets that seemed suitable and signaled Galactus before realizing that the plants on the planet were actually sentient and telepathic. When the plants begged her help, she pledge to save them if it meant her own life and as Galactus's servant R-11 arrived on the planet, his readings revealed the planet to be unsuitable. Thinking it odd that his readings were off, R-11 seemed confused but Dazzler began to think that perhaps Galactus had become less cruel and uncaring in the time she had spent with him. She soon set out once again to find a different planet for Galactus to consume and wound up in the middle of a space armada in search of vengeance against Galactus. Using Terrax's once-lost axe, the space armada mortally wounded Dazzler but she managed to make her way back to Galactus, who confronted the armada himself and killed everyone of them. When Galactus returned from the battle, he found that the power cosmic had restored Dazzler's health but she angrily announced that all she had worked for had been for nothing, as Galactus had become as heartless as Terrax ever was. Galactus corrected her, explaining that if her time with him had not changed him any, then he would have obliterated her instantly for her insolence. Instead, he proved his heart by releasing her from her slavery to him. Dazzler immediately returned to Earth but unfortunately, during the centuries she had been away, an unknown holocaust had destroyed all life on Earth. Since there was nothing left for her on Earth, Dazzler decided to return to Galactus and continue her duties to keep him from devouring inhabited planets. Comments: Created by Dan Fingeroth, Mike Vosburg, and Jon D'Agostino. Harry and Paul were not actually seen aside from a hologram in the issue. Alison Blaire was the same as her Earth-616 counterpart up until she was teleported aboard Galactus's worldship. Present at Terrax the Tamer's trial, she witnessed Terrax's exile into a black hole and afterwards, Galactus proclaimed her to be his new herald. After witnessing him devour a lifeless planet, Dazzler decided to only lead him uninhabited planets. As the years passed, she led him to many lifeless planets until she came across an armada using Terrax's discarded axe as a weapon of vengeance against Galactus. When she was mortally injured, Galactus himself killed the armada and Dazzler exclaimed that her time with Galactus had not changed him at all. He corrected her, explaining that if he had not changed, he would have killed her for her insolence but instead, he freed her from her slavery. Returning to Earth, Dazzler found it lifeless due to an unknown holocaust and opted to return to Galactus in order to keep him away from other inhabited planets. Dazzler had control over all forms of light on a cosmic scale. She traveled by generating "roads" of light and then "skating" over them. She could also fly and heal injuries at a vastly accelerated rate. Her power cosmic allowed her to sense planets that Galactus could feed on. Galactus was the same as his Earth-616 counterpart up until he banished Terrax and made Dazzler his new herald. In the years she spent as his herald, Dazzler led Galactus to numerous uninhabited planets. Her time with him softened Galactus's heart somewhat to the point where he purposely sent R-11 incorrect information when Dazzler accidentally signaled him to a planet with sentient life. When a space armada attacked Dazzler using Terrax's discarded axe, Galactus himself confronted and killed them. When he returned to his ship, Dazzler exclaimed that her time with him had not changed him at all. Galactus quickly corrected her and then freed her from her bond as proof. After she returned to Earth and found it a desolate wasteland, Dazzler returned to Galactus's service. Galactus had the same cosmic powers that his 616 counterpart had. R-11 was a servant android of Galactus who befriended Dazzler despite his lack of emotions. When Galactus named her his new herald, R-11 tried to explain to Dazzler that she had no choice but to accept her fate and years later, when Dazzler accidentally led Galactus to an inhabited planet, R-11 traveled to the planet itself where his information became mixed up. Thinking that contact with a nearby sun had fouled up his information, R-11 returned to Galactus's ship, not realizing that Galactus himself had altered the information to spare Dazzler the sight of him devouring an inhabited planet. R-11 had a computer-like brain capable of processing and storing information. 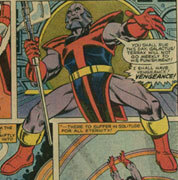 Terrax was a former herald of Galactus who had betrayed him. For his betrayal, Galactus decided to banish Terrax to a black hole for eternity. His axe eventually came into the possession a space armada, who tried to attack Galactus with it only to be killed by him. Terrax had the power cosmic, just like his Earth-616 counterpart.